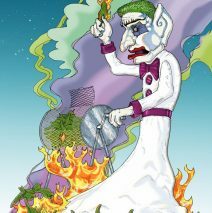 Zozobra in charge of chile roasting. ◆ What could be more seasonal and peculiar to Santa Fe than our own flammable Zozobra roasting New Mexico’s inimitable chile?! Russel Thornton’s fantastic rendering of Zozo is available as a greeting card – see it at the red counter along with other local artists’ cards offered for sale. Russ will be showing his body of work here at Joe’s in January of 2019. His imagination has no boundaries. ◆ And speaking of artists, a whole new roster of artists is showing art works here at Joe’s. Larry Glaister in the upper dining room is hardly shy about screaming COLOR! Roberta Perry’s landscapes in the Red Room tell stories of rough New Mexico terrain while Suzanne Kelly leads us gently through chamisa-lined pathways and snowy hillsides (showing along the ramp). All works are for sale. 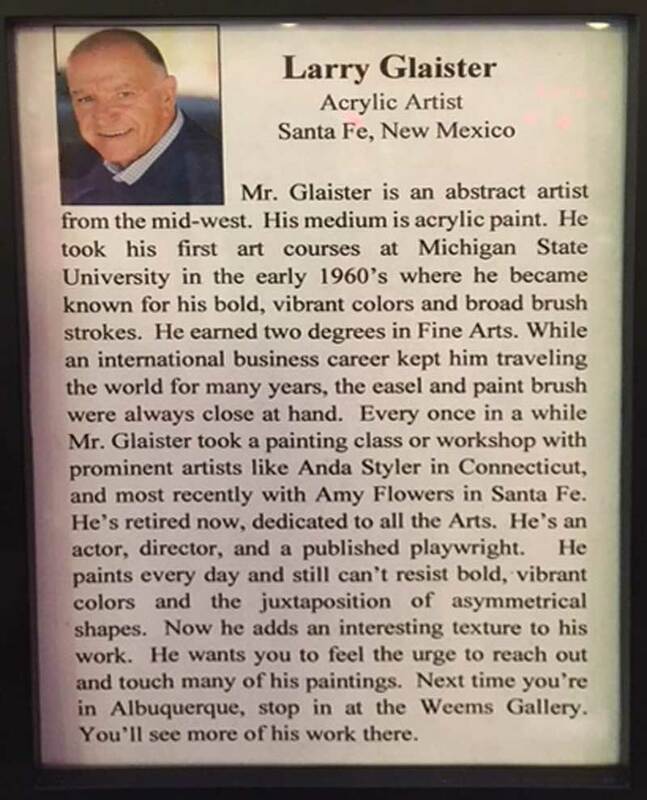 Artists are of course local. ◆ So many events!! I always think of July and August as the beginning of Christmas. Stay with me here. Folk Art Festival, Spanish Market, Indian Market, Fiestas, the burning of Zozobra, Pet Parade, Balloon Fiesta, Wine and Chile Fiesta …catch your breath…then suddenly it’s Thanksgiving. And as we all know Thanksgiving, in a heartbeat, gives way to Christmas and Hanukkah. See what I mean? July is the beginning of Christmas. So many events! And what did I miss? ◆Watch him work. Richard Eeds broadcasts theRichard Eeds Show live from Joe’s each 1stFriday of the month from 1-5pm on Hutton 1260 AM KTRC. Richard knows everyone in New Mexico and keeps us abreast of all the New Mexico happenings. ◆ Straws. When did the environment come down to a straw? I dunno. But anything that gets our collective attention enough to take action, I’m all for. Look around your house. If you stripped away all the plastic goods, what would be left? It’s utterly astonishing how plastic a has worked its way so ubiquitously into our lives. It has replaced wood, paper, glass, tin, silk, linen, wool, cotton, hide, hemp, waxed paper, metals — you name it. It’s choking our landfills and oceans and waterways and quite literally choking our precious wildlife. If straws can trigger more awareness and better choices – fantastic! Does Joe’s offer straws? Yes. However, they have been the compostable type for several years. Are they more costly? You bet. Will you join us in this very small effort to decrease waste? Please ask if you must have a straw. If not, together we will help our planet just a teeny tiny bit by discarding one less “thing”. ◆ DiJa Know? Here at Joe’s we really are committed to health and well-being – yours and ours. After all, we eat here too. While the relentless challenge of competitive pricing might tempt us (and all restaurateurs) to choose cheaper ingredients, we have chosen ingredients and sources that are definitely superior and yet may not be obvious. Like sea salt in the shakers, sauteeing with ghee and olive oil rather than cheaper oils, buying local and organic food products, eliminating Splenda, aspartame and other deadly sweeteners, shunning micro-waving whenever possible, using local organic flour for all our desserts and breads, using cane sugar rather than GMO beet sugar, cooking with stainless steel pots and pans rather than aluminum, revising many (not all) of our recipes to be gluten-free, the straws and many of the take-out containers are compostable not just recyclable. We offer the best quality food and ingredients you could get anywhere at any price. Many of you do knowthat and if youdon’t, your body does! u A Tuesday night tradition at Joe’s – Spaghetti and Chianti Night. $34 for twowill get you Caesar Salad, Spaghetti with homemade Bolognese and a ½ ltr of great Chianti. Wadda deal! The Bolognese sauce is made with our grass-fed-and-finished Berry Ranch beef. ◆ I guess it’s old news now but still bears repeating. And somehow I’m guessing it won’t change the shopping habits of many devotees of WholeFoods. People like nice shops, pretty surroundings and lots of choices even if those choices aren’t truly healthy or local or non-GMO – all the things we thought WholeFoods stood for. As it turns out, WFM now in the arms of Amazon, will blithely ignore all the standards they had claimed to champion, in favor of the buck. Don’t misunderstand, there’s nothing wrong with making a buck, but the deception is really disheartening and should embarrass them. Five years ago, under mounting pressure from consumers, Whole Foods Market (WFM) announced that by the end of 2018, the then-largest retailer of organic foods would require all of its suppliers to clearly label GMO ingredients and foods. We wrote about it here and thought it was wonderful. Early this June, Whole Foods reneged on that commitment. This time, there was no flashy press release, no media fanfare. Instead, a memo was circulated quietly to the company’s suppliers. If there was ever any doubt about WFM’s original intentions, those intentions are clear now: The company’s GMO labeling promise was always more about scamming us than it was about real transparency and forcing Big Food to change its ways. Very sad. the (GMO) seeds to planting, fertilizing, processing and shipping. We as consumers just cannot hand over the entire stewardship of our food to these few multinationals. Our passion here at Joe’s is for a local sustainable food supply – food produced by growers who are accountable for what they grow. KYG – Know Your Grower. We are able to look our local farmer in the eye and ask him about his growing practices or even visit his operation. This gives us the confidence that we are eating food that is healthy,wholesome, non-genetically engineered, often better than organic, humanely treated and minimally processed. It is grown with a smaller energy-use footprint and transported short distances. We cannot divorce human health, the economy, ecology, personal (perhaps spiritual) satisfaction or honorable work from food. Food is fundamental. What we eat, where it comes from, the stewardship of food animals, the nurturing and building of soils – all these factors affect us at a cellular and visceral level. Santa Fe is fortunate to have one of the very best Farmers Markets in the nation. Here at Joe’s we offer this bounty to you, keeping dollars in the community. In the interest of transparency, in 2008 Joe’s spent $30,000 on local foods. Each year that expenditure has grown. We currently far exceed $100,000 per annum (well over 30% of our food purchases). ♦Joe’s will give you $10. What’s the catch? Well the way we figure it, if you cut out the middleman by NOT using a credit card, we can give that back to you and then some. Credit cards costs the retail merchant about 3-5% and extra time & paperwork. Now let’s be real – in today’s world you can’t function without them. But there are alternatives that reduce our dependency on the Big Banks and actually save all of us money. We have a couple of suggestions: (1.) Joe’s Check List –If you are a “regular” and wish to pay by check, please ask your waiter to get you on the list. (2.) Joe’s gift card– purchase $100 gift card with cashor checkand get an extra $10 value! Roadside sign: Rabbits for Sale – cuddly or nutritious.